As the summer season dawns on us, boatbuilders up and down the country will be gearing up for the PSP Southampton Boat Show, and Haines Marine is no exception. The Norfolk-based manufacturer is planning to unveil a redesigned version of its 32ft Offshore model, and now we have a first glimpse of what the finished product will look like. With a striking new navy blue look, the hull has been created by renowned designer Andrew Wolstenholme, whose previous credits include Hardy, Broom, Cockwells and English Power Yachts. The extensive stringer and frame arrangement should provide the necessary rigidity so that the 32 Offshore can well and truly live up to its name, while a Nanni T4 will generate an ample 270bhp of thrust. Below decks, the layout is similar to the Haines 32 Sedan, with a large island double bed in the forward cabin, separate toilet and shower comparments, and a well-stocked galley. Haines also hints at added safety measures to make sea passage more practical, as well as mentioning a flexible settee arrangement in the saloon and cockpit areas. That’s all the detail we’re being treated to for now, but if the previous 32 Offshore (pictured below) is anything to go by then this model will cost upwards of £170,000 and boast a top speed in excess of 20 knots. 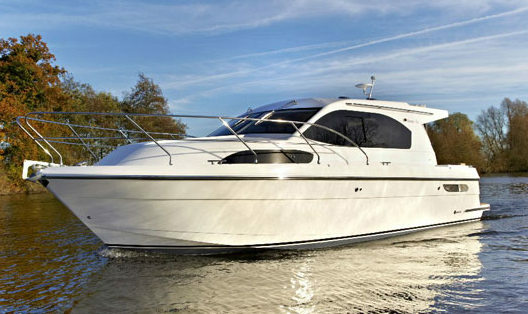 Full details will be revealed in time for the Southampton Boat Show (12-21 September), so watch this space.